Last year, just as our Director was busy packing up to move to a different house, another kitty in need came. Walking by the porch window, she thought she saw two little mice on top of a chest just outside the window. She did a double take, and realized they were newly born kittens – as in born within the last hour. They were half frozen, and Mama cat was found not far away, looking like she had no idea what had just happened. Victoria had never seen this cat before; she had simply showed up out of the blue. Grabbing her and her kittens, she brought them in the house, among the packing boxes. There was a heat lamp set up for some baby chicks, and she attempted to bring these kittens back to life under the lamp. This worked, but the mama cat seemed to have no idea what she was supposed to do with these kittens, even though she did take an interest in cuddling them. The problem was, she had no milk. Even though Victoria began to bottle-feed the kittens, keeping them on a warmer, and getting up every two hours in the middle of the night, they had not had a good start, and did not make it. But the mama cat was a strong, if young and naïve, young kitty. She appeared to be a Russian Blue, and so we began calling her Blue. She has turned out to be one of the sweetest cats we’ve ever met, and she doesn’t seem to have any kind of prey-drive. She never once bothered the baby chicks that Victoria and Rick were raising. And months later, when one of the “baby” chicks, now grown, caught pneumonia, Blue was right there with us while we attempted to save her life. Milly, a mostly grown chicken at this point, had to be brought in the house, where she received medication and was fed a sort of chicken gruel. The prognosis was not good. But we were all pulling for Milly, including Blue. One night, while Milly was being fed on our couch, Blue jumped up on the couch with her, laid down, and pressed against her, purring. There seems to be something about these “blue” cats that have come to Holly’s Place. Years ago, one was adopted out to a terminally ill patient, and he never left her bedside except for food and potty breaks. And Niamh, the blue Manx who didn’t really care for dogs, ended up going to Victoria’s dog Liam’s side and staying with him in the last months that he fought cancer. The moral of the story – dogs are not the only best friend of man. Cats do amazing things as well. Some of them are naturally what we call “nurse kitties,” being drawn to sick or dying humans and other animals and offering them comfort. 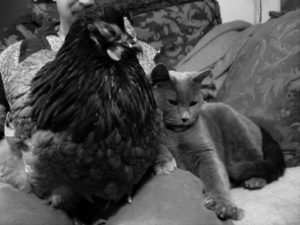 We leave you with this lovely picture of Blue snuggling with Milly the chicken.